The action has moved out of the arena and into full-scale rebellion as the latest "Hunger Games" film is poised to hit screens. Jennifer Lawrence, Josh Hutcherson, Liam Hemsworth, Elizabeth Bank and Woody Harrelson are all back for "The Hunger Games: Mockingjay - Part 1," as bow-wielding heroine Katniss Everdeen (Lawrence) becomes the face of the revolution against the Capitol and President Snow (Donald Sutherland). Based on the final book in Suzanne Collins' trilogy, "Mockingjay" is being split into two films ("Part 2" hits theaters next year) -- and that divide was a point of contention for some critics who have weighed in on the film. "The biggest problem with the new 'Hunger Games' movie is right there in the title: 'Part 1.' 'Mockingjay,' the final installment in Suzanne Collins' best-selling YA trilogy, wasn't conceived in two parts. That was a decision made in Hollywood by a studio looking to double down and milk every last dime out of its blockbuster franchise...You can't blame them for wanting to keep the good times rolling. But it's a pretty cynical business plan, and it's led to a film that feels needlessly padded. 'Mockingjay - Part 1' is like a term paper with the margins enlarged and the font size jacked up to reach the assigned number of pages." - Chris Nashawaty, Entertainment Weekly. "This third 'Hunger' installment is a nimbly constructed action-adventure blockbuster with a social conscience. It deepens the characters and further invests the audience in the saga of Katniss and her competing love interests, Peeta Mellark (Josh Hutcherson) and Gale Hawthorne (Liam Hemsworth)." -- Claudia Puig, USA Today. The director, and screenwriter Danny Strong, wisely use this film as a base camp for the big revolution stuff that comes next, establishing players and life-or-death stakes beyond the previous two films' relatively closed systems. From district to district, the people of Panem are rising up against their oppressors. These scenes are only referenced in the book, but Lawrence gives them stirring, vibrant life...The vague larger world of 'The Hunger Games' is waking up, and Lawrence has the sense to know when to pull back and show us just how big a thing a humble girl like Katniss has inspired." -- Richard Lawson, Vanity Fair. "Its retro-futuristic aesthetic lacks the flamboyance of past installments, but possesses its own grim integrity, and even contains one authentically shocking reversal that bears more than a whiff of a "Manchurian Candidate"-like menace. It's a joyless, surpassingly dour enterprise, but one that fulfills its mission with Katniss' own eagle-eyed efficiency and unsentimental somberness. 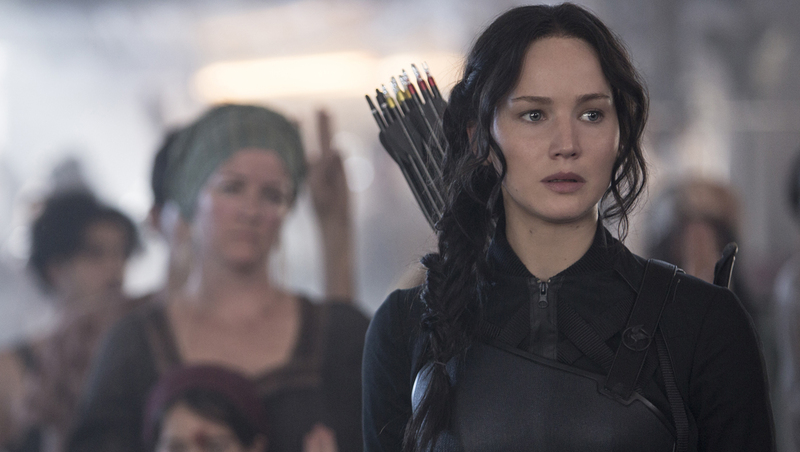 'Mockingjay' sets up the end Game with a grim sense of purpose." -- Ann Hornaday, The Washington Post. "There's heart in the vague yet stirring liberation story that comes to the fore in this chapter and that's echoed in real-life struggles around the world. And it's there of course in Katniss, the backwoods savior who, as played with guileless appeal by Jennifer Lawrence, is mounting an attack on the forces of oppression." -- Manohla Dargis, The New York Times. "'Unfortunately, 'Mockingjay - Part 1' has all the personality of an industrial film. There's not a drop of insolence, insubordination or insurrection running through its veins; it feels like a manufactured product through and through, ironic and sad given its revolutionary theme." -- Todd McCarthy, The Hollywood Reporter. "Like the novel, the screenplay (penned by franchise newcomers Peter Craig and Danny Strong) ably conjoins elements of political thriller, combat movie and mass-media satire, weaving a dense network of unsteady alliances, secret conspiracies, ratings-minded power plays and the always-knotty entanglements of love and war. It helps that some of Collins' storytelling devices, particularly her critical inquiry into the temptations of overnight fame and the uses and abuses of televised propaganda, feel naturally suited to the screen." -- Justin Chang, Variety. "Still, even with [Philip Seymour Hoffman]'s subtly brilliant reaction shots, it does not seem to be the type of movie that fans will revisit on its own. This half is part of a whole in the most cynical way. You say you want a revolution? They'll get to that next year." -- Lindsay Baher, Associated Press. Tell us: Do you plan to see "Mockingjay - Part 1"?